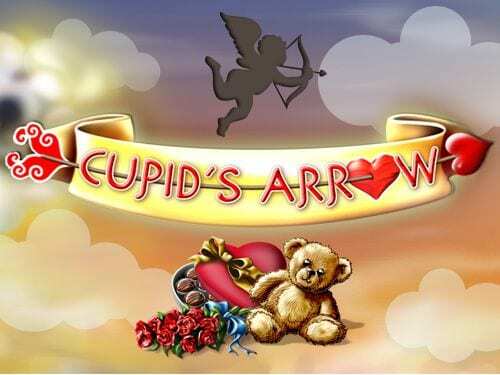 Cupid’s Arrow is romantic 5 reel filled with angelic cherubs, harps and angels designed to get you broody and hopeful for those lucrative Free Spins. Join the god of love and play slots online with this online slot favourite. Love or riches which one will it be? Click to see these slots online and read more details. If you were to mention the name Eyecon what comes to mind immediately is iconic and many to discover more. The past titles by Eyecon have all proven to have different levels of success across the entire globe. A staple in the slot online games scene, responsible for so many thoroughbred titles. Have you ever been in love? Well, you're about to with one of the best-rated online slots: Cupids Arrow from Eyecon! You quite literally have your head in the clouds in this game as Cupids Arrow is set on a very puffy bed made seemingly out of nothing but love. Now that we have the soppy talk out of the way, it’s time to talk about the game! 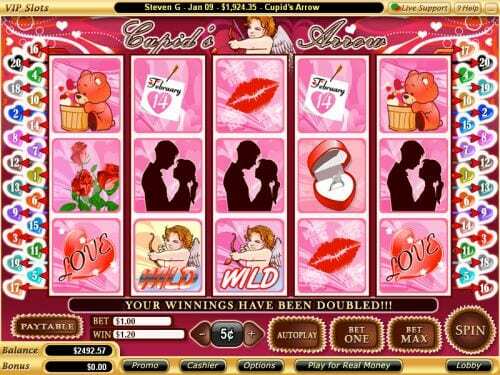 Cupids Arrow is your classic 5 reel 25 payline slot. Symbols included in this game consist of all the usual Valentine's day suspects Cupid’s head, golden hearts, candy hearts, cloud hearts chocolates, roses etc. In Cupids Arrow, the gold heart symbol represents the wild symbol which has all the tendencies of a regular wild you’d find in this kind of slot. Hitting the wild will substitute most of the other symbols except for the candy heart symbols. Matching these candy hearts anywhere up to 5, will trigger the game's prize pick round where the player will have to use a bow and arrow to possibly multiply their original stake for the potential of higher payouts. Matching 3 or more cloud heart symbols will trigger the games ‘Match & Win’ feature. This feature will transport you to another cloud where you will play a game of snap in order to gain a bonus multiplier that will again increase your overall score. Like most Eyecon games, free spins are a very big part in Cupids Arrow. Trigger the free games by matching 3-5 Cupid heads which in turn can award the player up to 9 free games! In the free games, you have the chance to once again increase your chances at additional prizes. In a free game, if Cupid’s head appears on any reel that a candy heart is on then this will cause the game to play an animation of an arrow being fired across the screen. This will award the prize of an added multiplier to the current stake or the possibility of up to 10 additional free spins. So many ways to play this game will not make it interesting even if it isn't valentine's day. If you enjoyed Cupids Arrow then you are bound to enjoy our Fluffy Too slots game.